Batman Forever Pinball machine in fantastic cosmetic condition. 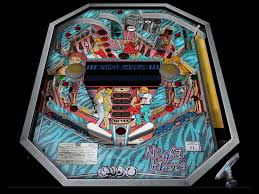 Features Batwing Ball Cannon, Bat Cave Ball Lock Area, several electric-green wireform ramps with the BatCave escape ramp extending down behind the flippers and over the playfield apron, releasing balls “up” the playfield duringmultiball. BatWing cannon rotates & aims across the playfield and fires ball with pistol grip on front of machine. Features genuine speech clips from the movie. Flippers (3), Ramps (3), Multiball, Automatic Plunger, Batwing Ball Cannon. Pistol Grip ball shooter. Unlimited buy-in balls per player (operator option). Dot Matrix Display, at 192×64 pixels, is larger than standard, and is powered by a 68000 CPU.